Laurent Blanc will take over as French national coach after the World Cup finals in South Africa. 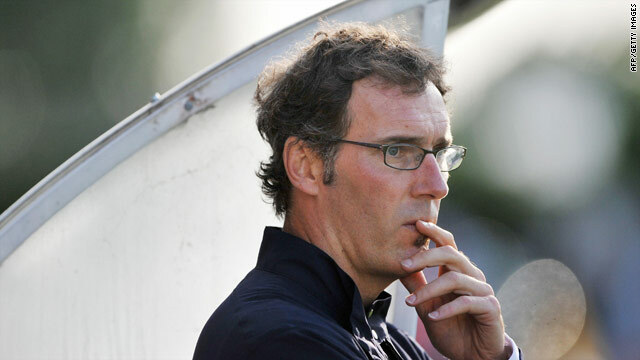 (CNN) -- Former French Ligue One champions Bordeaux have confirmed that they have agreed a deal for coach Laurent Blanc to take over as French national coach from Raymond Domenech after the World Cup finals. After initially expressing anger at the French Football Federation (FFF), for their pursuit of Blanc, Bordeaux confirmed in a statement on Thursday that an agreement had finally been reached for the 44-year-old to take over the position. "The French Football Federation, its president, Jean-Pierre Escalettes and Bordeaux FC, its president and shareholders, have reached an agreement for the recruitment of Laurent Blanc as the coach of the France football team," confirmed the statement. It is not clear how much compensation has been paid by the FFF to entice Blanc, but club president Jean-Louis Triaud had earlier stated on Bordeaux's official Web site: "I have no intention of giving gifts to the FFF." Triaud also revealed that he believed Blanc's head had been turned by the FFF's advances, resulting in Bordeaux's challenge for a second successive French league title collapsing over the second half of the season. He said: "Honestly, I am convinced the federation were making plans before the end of the season. The media frenzy around Laurent Blanc is sure to have disturbed the squad. "The FFF's influence was heavy in the second half of our season. That added to the team's troubles." As a player, Blanc helped France win the World Cup in 1998 and the European Championships two years later. He retired from playing in 2003 and was appointed Bordeaux coach in 2007, leading the side to second place in his first season before securing a superb League One and League Cup double in the 2008-2009 season. CNN Blog: Who will win the World Cup?